Every teacher loves a great back-to-school read aloud. There are so many popular titles to use as springboards for first day experiences, engaging students in making new friends, or getting back into the swing of school routines. 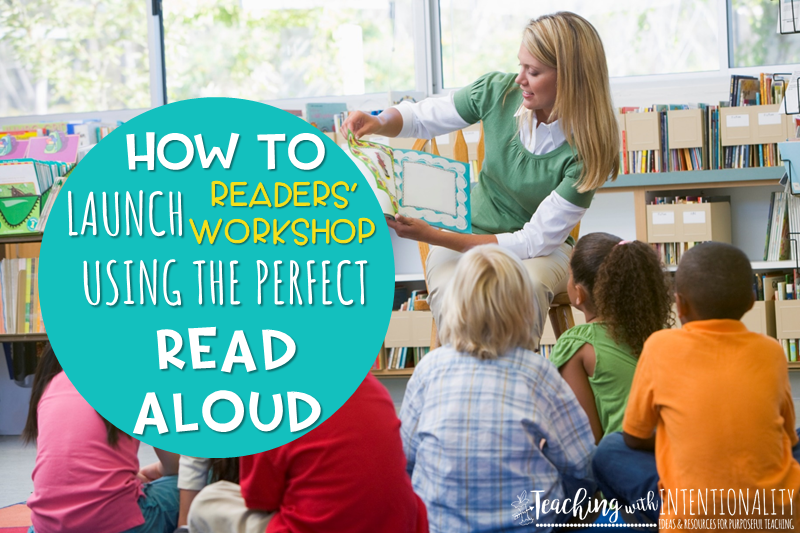 But what about a read aloud for introducing reader’s–workshop? I have found the perfect story that will not only set the tone for your reading instruction but also foster a growth mindset toward reading we’d all like to instill in our students. This book has been powerful in launching my readers’–workshop when used with the following activities. 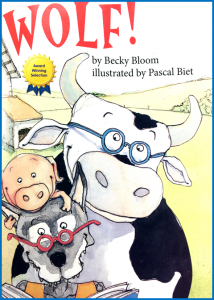 Wolf!, by Becky Bloom, is a story of a wolf who comes across some barnyard animals who can read. In the story, the wolf is determined to learn to read, but he has a lot of misconceptions about what makes a good reader when trying to impress his friends. This is the perfect storyline to get students focused on what good readers do, and to help dispel any misconceptions they may have about what a good reader is. Before introducing the story, I have my students do a brainstorming activity. On a Post-It, I ask students to write what they think makes a good reader. After a few minutes of think and jot time, I have students share their ideas as I record them on a chart paper. As you can see from the anchor chart, students said many different things about what they do. You can also see some misconceptions students shared, but when recording their responses, I don’t comment on any of them. I simply take note of their ideas and tell students we will revisit this list later. Next, students go to the carpet for the read aloud. 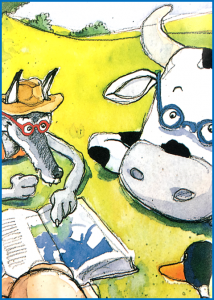 I preplan the occasional turn-and-talk during the story to get the students thinking about what Wolf thinks a good reader is, as well as what the barnyard animals think. Later in the story, I also ask students to evaluate those points of view based on students’ own perspective about what makes a good reader. Wolf’s perception changes in response to the animals’ comments each time he goes back to the farm to read to them, so of course, I also ask students to think about how his point of view changed. After the read aloud, we revisit the list we created on the chart. I have students consider Wolf’s experience in the story and talk in table groups for a few minutes to discuss whether they agree or disagree with the various ideas on the chart. Then, I ask students to share their thinking in a class discussion and have them explain why they think the idea is important, or why they might disagree with an idea. Two things happen at this point in the lesson. One, students review good strategies and reiterate why they are important, and two, the misconceptions get dispelled. Dispelling these misconceptions transforms students’ way of thinking about reading and about themselves as readers, just as it did for Wolf in the story. 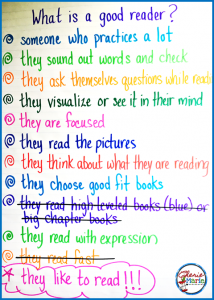 Students need to have the mindset that a good reader is defined by what they do each and every day (strategies & good reading habits), not by their performance with regard to reading level, the thickness of their chapter book, or the speed at which they read. Yes, we want our students to move in the right direction with text complexity and fluency, but for this lesson, I want to foster growth mindset in my students. Notice, I crossed out those misconceptions as we talked about them. I want to point out that students usually leave one important idea off this list, which needs to be added. This is why I turn to the last part of the story and reread where Wolf gets caught up in the stories with the other animals. I want students to come to the conclusion that good readers also enjoy reading, and rereading this part of the story prompts them to add this. 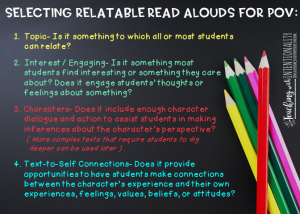 If students have already included this on the list, I would star it to remind students that our attitude toward reading is just as important as the strategies we use. The next activity lays the foundation for the purpose of our reader’s–workshop: to grow as readers. 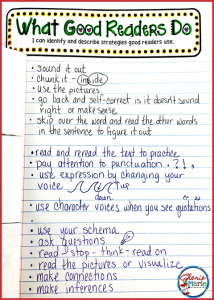 Students are given an interactive notebook template which becomes one of the very first entries in their reader’s notebook. During this activity, we brainstorm various strategies that have helped them with their accuracy, fluency, and comprehension. You can download this complete lesson in its entirety by subscribing to my free resource library. To wrap up this activity, I begin to talk about how every reader has different strengths and weaknesses, and that during reader’s– workshop, we will be exploring our own strengths and weaknesses so that we can set goals to help us grow as readers. I explain that everyone will have different goals based on where they are and what will help them. I also explain these goals change, just as Wolf adjusted his goals throughout his journey in becoming a reader. 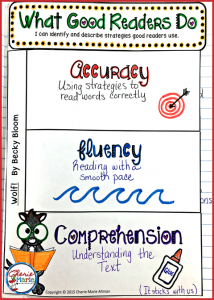 Not only has this anchor lesson been powerful in helping my students understand the purpose of reader’s–workshop and to foster students’ growth mindset, but it has also set the stage for next steps: reflecting about themselves as readers and setting goals. I hope you will take a moment to read this wonderful story and find a way to incorporate it into launching your reader’s–workshop. If you are interested in more seed lessons for launching reading strategies, click the resource cover below. 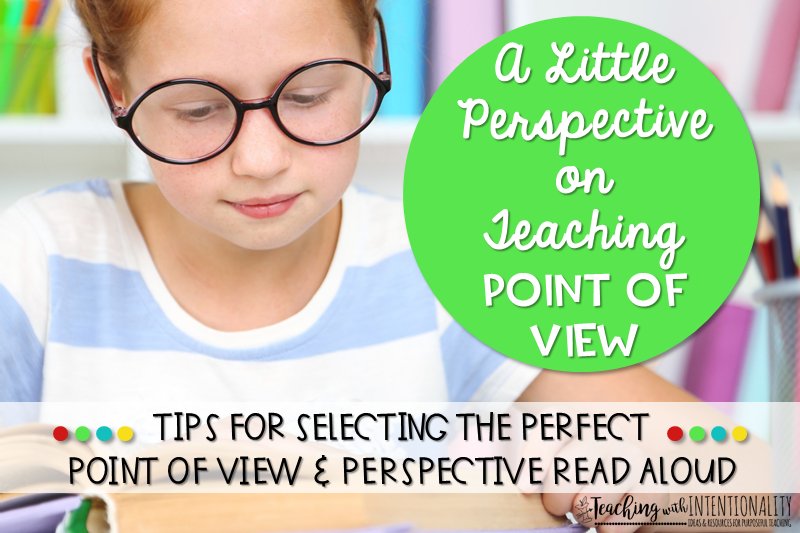 When we think about teaching point of view, we immediately think of 1st person or 3rd person. But this is only the beginning of the journey for our students. Point of view (or Literacy CCRA.R.6) can be a difficult standard to teach. In second grade, students are expected to use different voices for the different characters in a text. At a glance, this doesn’t seem very difficult. But when we take a closer look, there’s a lot more involved. This point of view standard requires students to analyze the character before determining how their voice should be read. What is the character like (traits)? What is the character feeling? How would the character say something in the situation? What is the character’s point of view about the situation? How should one character’s voice be different than that of another’s? That’s a lot to consider for a second grader! Since understanding point of view in third grade is dependent on students’ analysis of the character’s traits, feelings, motives, and responses to other characters or the events in a story, naturally it would make sense to incorporate Literacy CCRA.R.3 when teaching point of view. This is where we have opportunities not only to bridge grade level expectations but to weave together other standards in our approach. With the right text and guidance, we can make use of every opportunity to engage students in making these connections as they go deeper with the text and integrate standards. The following are a couple of approaches I have found conducive to successfully doing this. These include how to select the perfect read aloud that lends itself to teaching POV & perspective. Using a narrative poem like Shel Silverstein’s Crocodile’s Toothache is a perfect example. It has a topic with which most students can relate: going to the dentist or having a toothache. It has a speaker that tells the story 3rd person, and it has a lot of dialogue and action between two very animated characters: the evil dentist who has no consideration for the crocodile’s feelings and the crocodile who is in agony and at the mercy of the evil dentist. It’s humorous. It’s of high interest to students. It’s easy to analyze the characters’ traits, feelings, and motives by what they say or do. More importantly, students can take it to the next level by making connections with the crocodile’s situation and making inferences about the characters’ points of view regarding the value of teeth (i.e the dentist plucks away at them as if they don’t matter, while the crocodile cherishes them for obvious crocodile reasons). With this understanding, students can also determine their own point of view based on their own experiences and feelings about their teeth or visits to the dentist. I can’t express how much I value the use of narrative poetry to organically weave together these learning targets so seamlessly. Students can begin by using character graphic organizers to analyze characters to determine their traits and feelings. They can also interpret the speaker’s voice/expression by paying close attention to repetitive words, onomatopoeia, and punctuation. 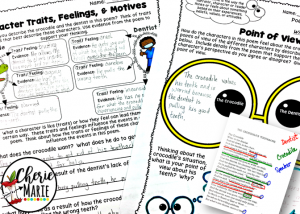 Students can consider the characters’ traits, feelings, motives and responses to a situation to help them determine the characters’ point of view or perspective about the situation or topic. They can make text-to-self connections with the crocodile and his predicament to determine their own point of view. They can also practice their fluency by reading and rereading this short text. That is a lot of intentional instruction with just one text! When we can repurpose a text for a close read and to get students digging deeper into the text, it’s a win-win for both teachers and students. I encourage you to try it out. For my free resource that goes with this poem sign up for my free resource library to get this and exclusive resources I offer on my website. Another approach I use to introduce point of view to my third graders is the relatable read aloud. When we offer our students stories that are fun, of high interest, or are about a topic with which they can easily relate, students get it. In third grade, students not only have to determine a character’s or narrator’s point of view, they have to ask themselves whether they agree or disagree with either of these perspectives. This means they have to evaluate the point of view of the character or narrator based on their own experiences, beliefs, values, feelings, or attitudes about the topic or situation presented in the story. This brings RL.6 to a higher level of thinking, especially since we expect students to justify why. When students can naturally connect with a text because they can easily relate to the topic or story situation, or they can make connections with the character’s experience in the story, it makes this expectation much more tangible for them. If we begin with these types of texts, students are better equipped to express their perspectives and why they agree or disagree with the character’s or narrator’s point of view based on their own experiences, beliefs, values, feelings, or attitudes. Below are a few things to consider when seeking out other story titles that could work just as well. For engaging, no-prep activities for teaching point of view and perspective, please visit my store for this resources. This toolkit focuses on RL3.6 & RL4.6.